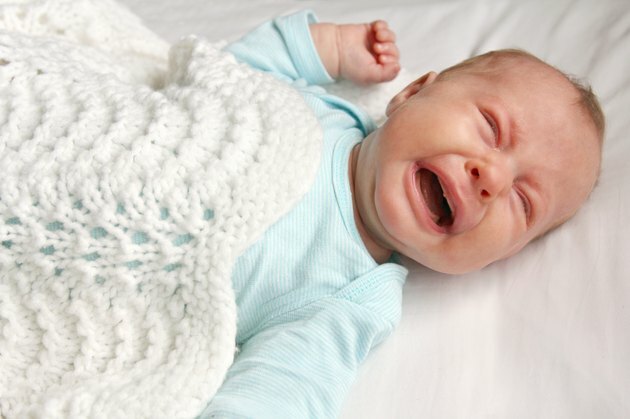 What Is the Difference Between Colic & Reflux in a 7 Week Infant? Both colic and reflux can test a new parent's stamina and patience, but the conditions have very different symptoms. Colic is characterized by general irritability late in the afternoon. A colicky baby is content in the morning, but seems to wind up as the day progresses. You'll quickly learn ways to create a calming environment that reduces the symptoms of colic. Reflux, on the other hand, is more unpredictable, flaring up throughout the day, especially after feedings. Because reflux is a medical condition, it requires more complicated treatment. Seek your pediatrician's advice if you suspect reflux. A 7 week old with colic is often fussy in the late afternoon or evening. The baby may be happy throughout the day, but completely unravel around dinner time. These babies are probably suffering from environmental overstimulation, according to Dr. Jerry Rubin, MD, author of "Naturally Healthy Kids," rather than underlying medical problems. Babies with reflux usually exhibit symptoms immediately after eating throughout the day and night. They may spit up frequently or you may notice gurgling bowel sounds or problems with gas. Babies with true colic may cry in the evening, but the cries don't necessarily indicate pain. Babies with reflux may cry out sharply as if in pain, drawing their legs to their chests or arching their backs. Colicky babies can usually be comforted if you take them into a darkened room, rock them or sing to them. A baby with reflux stops crying only when the pain associated with feeding subsides. Babies with reflux may gain weight poorly or may avoid feeding, which causes pain. Alternatively, some babies with reflux get relief from nursing and want to nurse constantly. Colic typically begins around the second week of life, but slowly gets better by the time your child is seven to eight weeks old. If symptoms continue or worsen, suspect reflux. As many as two-thirds of young babies have some signs of reflux, according to the AskDrSears website, but most outgrow it by 1 year of age. In addition to reflux, colic symptoms can be caused by food sensitivities, ear infections or other underlying medical conditions. Dealing with an infant with colic can be emotionally and physically exhausting. Trust your instincts and seek the support and advice of your pediatrician. Many new parents blame a lack of parenting experience on colic and don't seek help. Allowing a baby to cry it out generally doesn't help colic and can make reflux worse.